The funny is returning to Freeform in March. The cable channel has announced that their comedies Young & Hungry and Baby Daddy are returning on Monday, March 13th. 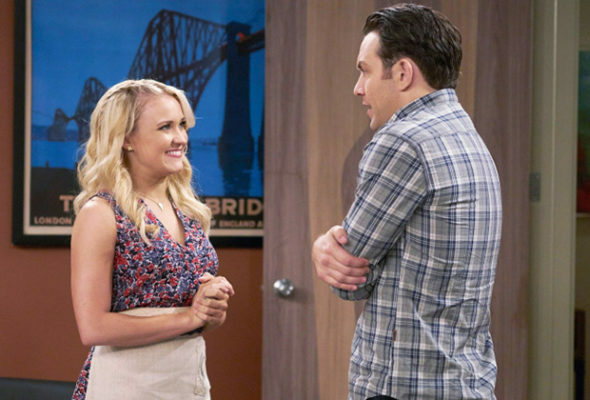 Young & Hungry will be starting its fifth season at 8pm. Back in October, star Emily Osment had tweeted that the show had been picked up but Freeform hadn’t officially confirmed it. It’s unclear how many episodes have been ordered this time around. There were just 10 episodes in seasons three and four, compared to 20 in season two. Meanwhile, season six of Baby Daddy will launch at 8:30pm on March 13th. This renewal was officially announced back in June 2016. The venerable comedy will surpass the 100 episode mark. It’s unclear how many episodes have been ordered but recent seasons have had at least 20 installments. “Young & Hungry” will premiere season five on Monday, March 13, at 8:00 p.m. EDT. In the fourth season finale, Gabi and Josh decided to be “friends with benefits,” much to the group’s chagrin, after their previous attempts at a relationship went awry. During the new season, Gabi and Josh try to prove to everyone that they won’t let feelings get in the way of their new arrangement, Sofia continues on the path to a career in journalism, and Josh faces an unexpected reunion with his estranged father. Comedy legend Betty White guest stars this season as neighbor Ms. Wilson. “Young & Hungry” stars Emily Osment, Jonathan Sadowski, Rex Lee, Aimee Carrero, and Kym Whitley. The series is produced by David Holden, Ashley Tisdale, Jessica Rhoades, Caryn Lucas, Andy Cadiff, and Eric Tannenbaum and Kim Tannenbaum in association with CBS Television Studios. Gabi Moskowitz, of BrokeAssGourmet.com, is a San Francisco-based food blogger and contributed to the development of this project. The season six premiere of “Baby Daddy” will air on Monday, March 13, at 8:30 p.m. EDT. The premiere picks up three months after the finale, and Ben is still enthusiastically searching for the mysterious Elle. Danny and Riley are hunting for a good doctor to help with the pregnancy, and Bonnie desperately wants to be involved. Tucker is back from Los Angeles, but refuses to tell anyone what happened while he was there. The hit comedy series will reach the coveted milestone of 100 episodes during this season. The series stars Jean-Luc Bilodeau, Derek Theler, Tahj Mowry, Melissa Peterman and Chelsea Kane. The series is created and executive produced by Dan Berendsen. Heidi Clements, Vince Cheung, Ben Montanio and Michael Lembeck also serve as executive producers. What do you think? Are you looking forward to watching the new seasons of Young & Hungry and Baby Daddy? More about: Baby Daddy, Baby Daddy: canceled or renewed?, Freeform TV shows: canceled or renewed?, Young & Hungry, Young & Hungry: canceled or renewed? Oh my god. This is the funniest show EVER. My husband and I can hardly wait at the end of the day, to see and laugh with this great show. We R so very sad to hear it is cancelled! All of these fine actors and writers , we will miss! Please reconsider! Baby dad yes.. young and stupid……bad…..